Dev Diwali 2020 date is on Sunday, 29 November. 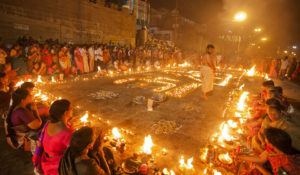 Deva Deepawali or Dev Diwali is the festival celebrated every year in Varanasi (Kashi) on Kartik Purnima day. It is celebrated to mark the victory of Lord Shiva over demon Trupurasura. The festival is also Known as Tripurotsav. The main ritual is performed on this day is Karthika Snan i.e., taking holy bath in the Ganges river and offering of oil lighted lamps to Ganga. Kartik Poornima is associated with Prabodhini Ekadashi. The 5-day festivals start on Prabodhini Ekadashi (11th lunar day of Kartika) and conclude on Kartik Poornima.